As I was reading articles on the history and categories of font, I became somewhat impatient. I had an example of font, and I wanted to know exactly which one it was. Before, I was busy placing it into a typeface category such as old typeface or modern, and then analyzing the serifs, etc. However, I wouldn’t be entirely certain that my guess at what font it was is correct. So I Googled. Oddly, there is only one app that I can find that would achieve my impatient wishes. 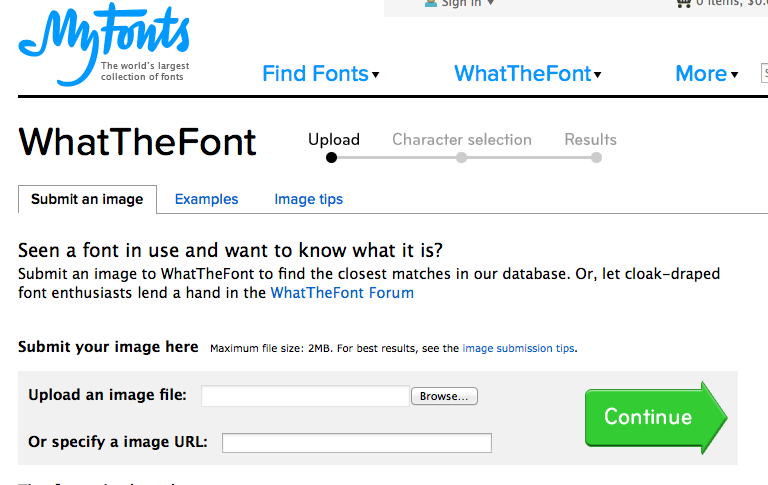 What the Font allows the user to take a photo and then the program will analyze the font. It spits out results, sometimes with only one option and sometimes with a short list of possibilities. With a little luck, the uploaded picture registers and is identified. To help the program’s process, What the Font suggests increasing the contrast, making the picture as horizontal as possible and ensuring the the unique characters in the font are in the picture. And if the program still can’t produce results, What the Font features a forum for font enthusiasts to come to the rescue just in case. It’s a very neat idea and a pretty cool app. The program needs a little work, but for the most part, it’s impressive. Take it on the go with their mobile app or use it on the computer. Hey Ashley. It looks like you have a bad link on What the Font. You might also introduce yourself on your About page. You do a good job of explaining the purpose of your blog, but never really tell the reader who YOU are. I love the idea of this blog. Learning appropriate typography will not only benefit everyone in our class, but anyone in the blogosphere. I look forward to your future posts. Thanks Gary! The link should be fixed – what’s funny is that the new link didn’t have anything changed but works now. Go figure. Thank you for pointing that out!